In this video Sarum Electronics demonstrates the functionality of our Duty Share Control Panels for Air Conditioning Systems. The control panel is designed for wall mounting and manages the functions of two Air Conditioning Units on a duty share basis switching automatically to the second unit after a set amount of hours or when the fault signal is received. Both units are allowed to work simultaneously when the room temperature rises above the adjustable set point and once the temperature drops, the control panel will switch to normal operation settings. In this video Sarum Electronics demonstrates the functionality of our Battery Backup Units. Within the Battery Backup Units are three damper controllers; the reverse polarity, the time diverse polarity and the C Fire damper. There are various inputs within: the weather switch, the day switch, manual call point and the fire alarm. The various inputs can alleviate the worry of leaving on your air conditioning, fire hazards and slipping hazards. The 2 amp, 6 amp, 10 amp versions can operate one zone at a time. Depending on your requirements there are also the 20 amp and 40 amp versions which can function with additional expansion boards. 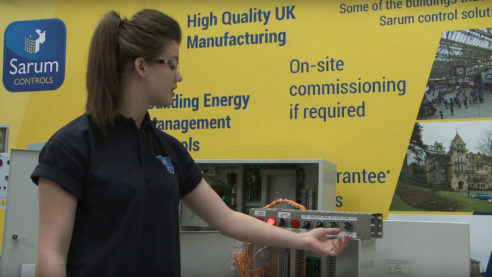 In this video Sarum Electronics demonstrates the functionality of our Touch Screen Control Panels. Each sub panel can control a separate building with up to four rooms. All buildings can be easily enabled from the main touch screen. Each unit has frost protection, so when the outside air is cold it enables the heating to stop the pipes from freezing. Internal and external sensors on each panel are easily accessed on the overview page. For more accessories visit our accessories page.